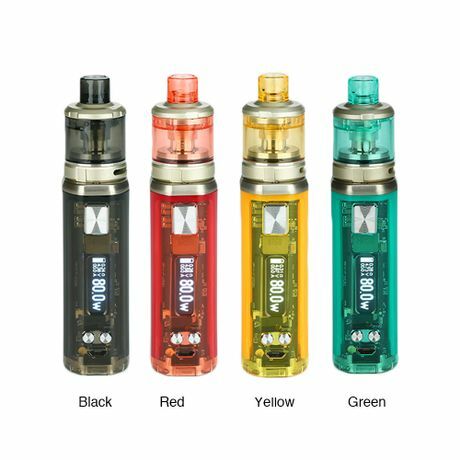 Here is Freemax Twister Kit. It consists of the Freemax Twister 80W battery and the Fireluke 2 Mesh Tank. The Freemax Twister has the pen-style design and elegant exterior. Powered by the built-in 2300mAh battery, the Twister supports a 80W max output. With the twist-style variable wattage function, you can easily switch the output wattage from 5W to 80W by the simple twist of the base. The Freemax Twister features an advanced chip which provides multiple protections and fast fire speed. And the LED light embedded inside the firing button indicates various working conditions. 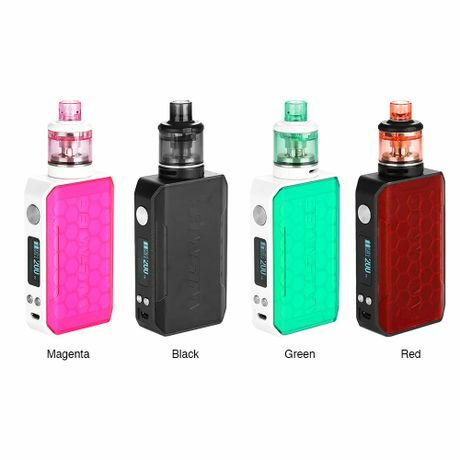 Vigo is another trendy and portable kit from VapeOnly, which includes a built-in 900mAh battery and a 2ml capacity tank. Similar as the Smooth, Vigo also has three level adjustable wattage of 7W, 11W and 15W to meet different tastes. With the unique CBD mode, you can enjoy different kinds of eliquids on it. The Vigo tank is a top aiflow for anti-leakage atomizer. It comes with the 0.8ohm KA1 coil for flavorful clouds. All in all, VapeOnly Vigo is definitely your smart choice. Introduce you a fashionable mod from Vsticking, called VK530. Powered by dual 18650 batteries, it supports the max output of 200W with various working modes, including TC(SS316L7 Ni200/ Ti 01), SX Pure, Manual TCR. VK530 mod adopts the reliable and advanced YiHi SX530 chip. The new SXi-Q control system can bring you extra vaping fun of customizing your own wallpaper. Along with the TFT IPS HD screen and various protection, Vsticking VK530 is a powerful yet reliable mod to collect. 7 colors in available. It's celebration time in China! Everyone is preparing for the oncoming Chinese Spring Festival of 2019! To share the joy with our beloved retail customers, we launch an Early Spring Sales for you! Let's enjoy a hot bargain at the cold winter! Sales: Get 30% off for all items except Clearance Sales, Premium E-juice, Joyetech, Eleaf, Wismec, Swedish Vaper HotRod, ArteryPal II and IPHA Swis. 1.This sale is only for Retail customers. All the discounts above refer to goods cost only, shipping fee excluded. 2.When you applied the coupon code, the total goods cost turned to 30% off directly. You can compare with the original price to get confirmed. 3.Other discount or code cannot be applied at the same time. 4.Unpaid orders will be cancelled before and after sales, don't forget to pay! Say hello to the new upgraded version of Wismec Sinuous series - Sinuous V200, which is a fashionable kit composing of Sinuous V200 mod and Amor NSE tank. Made of transparent PC material, it has the impressive transparent body with comfortable hand feeling. Powered by dual 18650 cells, Sinuous V200 mod supports the max output of 200W with various working modes. The 0.91 inch OLED display shows vaping parameters very clearly. Designed for both MTL and DL vaping, Amor NSE is a cost-effective tank with 2ml/3ml ejuice capacity. It features retractable top filling solution & refined airflow control system, providing you a great vaping experience. It comes with WS04 MTL 1.3ohm coil head for high-nicotine/ nic-salts e-liquid and new WS-M (Mesh) coil for fantastic flavor and massive clouds. 4 colors to select. Don’t forget to use the code “AHG15” to enjoy the 15% off discount. Introduce you a new sleekly designed pod kit by Eleaf, called Elven. With the durable metallic finishes, it gives you good texture and comfortable hand feeling. Elven comes with a built-in 360mAh battery with 15W max output and two 1.6ml cartridges. The 1.6ohm coil is optimized for more flavorful MTL vaping and gives a higher nicotine satisfaction. Moreover, you can enjoy different airflows by inserting the cartridge in two ways. Plus the no button design, easy side filling system, Eleaf Elven is a perfect pod kit, worth of your try. 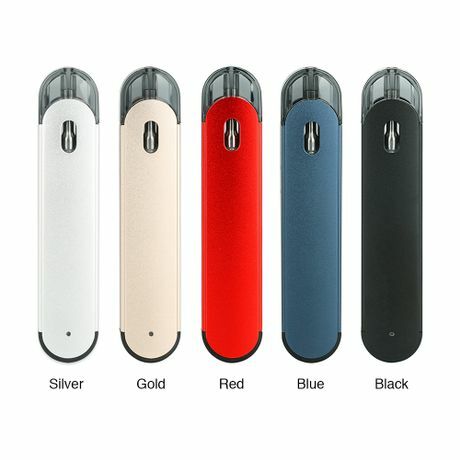 Introducing you a slim and portable pod kit called Hotcig Kubi Pod Starter Kit, which adopts 550mAh built-in battery. With ceramic coil in pod, the Hotcig Kubi is designed for nic salts and juices with high nicotine strength. The Hotcig Kubi Kit features air-activated switch. so it free your hands with no button. Just inhale and the device will automatically start to work. The food-grade PCPG material of Kubi brings a safe vaping experience for the users too. There are also 5 colors for selection. Introducing Wismec Sinuous V80 is sleekly-designed and crafted with . 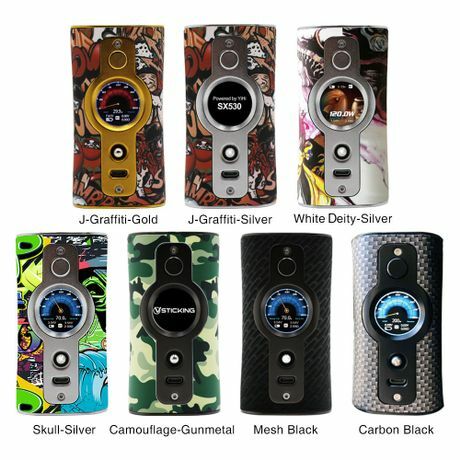 Powered by a single 18650 cell, it reaches a maximum 80W output along with a sequence of other unique features including centered 510 connector, 2A quick charge and 0.91-inch OLED screen. While the Amor NSE atomizer comes with 2ml/3ml e-juice capacity, retractable top filling and refined bottom airflow design. Together with unique WS series coils such as WS04 MTL 1.3ohm coil head for high-nicotine/ nic-salts e-liquid and new WS-M (Mesh) coil for intense flavor and huge clouds, the Wismec Sinuous V80 offers you incomparable vaping experience with intense flavor and huge clouds! Just match the Wismec Sinuous V80 with the Amor NSE, you will enjoy both MTL and DL vaping! 30% off Sitewide, Chinese New Year Sales Starts Now! HAPPY CHINESE NEW YEAR! Our holiday will go on from Feb. 02 to Feb. 11 to celebrate the biggest festival. Before and after the holiday, the shipping will be delayed for about one week. And there will be no customer service from Feb. 02 to Feb.11. The orders placed during CHINESE NEW YEAR will be prioritized for delivery after the holiday. In order to make up the delay, we offer a great sales for you. Thanks for your support. Sales: Get 30% off for all items (Clearance Sales, Premium E-juice, Joyetech, Eleaf, Wismec, Asmodus, DOVPO, Lost Vape, Modefined, Swedish Vaper HotRod, ArteryPal II, Artery Pal One Pro, IPHA Swis and some other products excluded). This sale is only for Retail customers. All the discounts above refer to goods cost only, shipping fee excluded. When you applied the coupon code, the total goods cost turned to 30% off directly. You can compare with the original price to get confirmed. Can't use any extra code at the same time. Unpaid orders will be cancelled before and after sales, don't forget paying! Enjoy vaping with Heaven Gifts! IJOY newly released a more compact and delicate version of the previous Shogun Univ, called Shogun JR. Like its old brother, Shogun JR adopts the same beautiful double-sided resin panels design but the panel is replaceable, which makes your vaping life more colorful. Powered by inbuilt 4500mAh battery, it fires up to 126W output with multiple vaping modes. Besides, the UNIV chipset provides you a safe and stable performance. The paired Shogun subohm tank has 2ml/6ml ejuice capacity options. It comes with advanced mesh coil for excellent flavor and big clouds. If you're looking for a new kit, this IJOY Shogun JR is a decent choice. Don't forget to use the code “AHG15” to enjoy the 15% off discount.